Pickering Electronics are the leaders in Reed Relays, Pickering reed relays are encapsulated using a soft inner material to greatly reduce physical stresses on the glass/metal seal of the reed switch capsule. 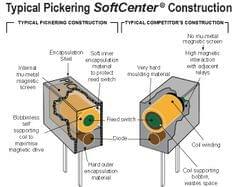 Reed switches are operated by the magnetic field from a coil which is wound around the reed switch capsule. Without a magnetic screen, this field will spread some way outside the confines of the relay package and will de-sensitize other reed relays mounted alongside. As an example, an unscreened relay mounted on 0.2 inches (5.08mm) pitch, will require a coil voltage about 25 percent higher to operate it, when other relays alongside are also in an operated state. This falls to between 1 and 5 percent, according to type, if magnetically screened. 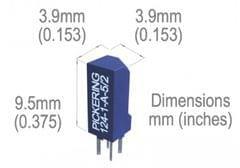 Smaller Pickering relays on 0.15 inches (3.81mm) pitch, would have an interaction figure as high as 40 percent if unscreened. The effect of magnetic interaction is compounded when temperature is also considered. The operating coil is wound using copper wire which has a co-efficient of resistance of approximately 0.4 percent per degree Centigrade. This means that a temperature increase of 50 degrees Centigrade will increase the coil resistance by a further 20 percent. The coil current and therefore the level of magnetic field, will fall by this same amount. A corresponding increase in drive voltage will therefore be required to generate the necessary magnetic field to operate the reed switch. MAGNETIC SCREENING IS ABSOLUTELY ESSENTIAL FOR SMALL REED RELAYS. Relay operating coils are commonly wound on bobbins. The great majority of Pickering relays are manufactured with self supporting coils, thus avoiding the space required for these bobbins. 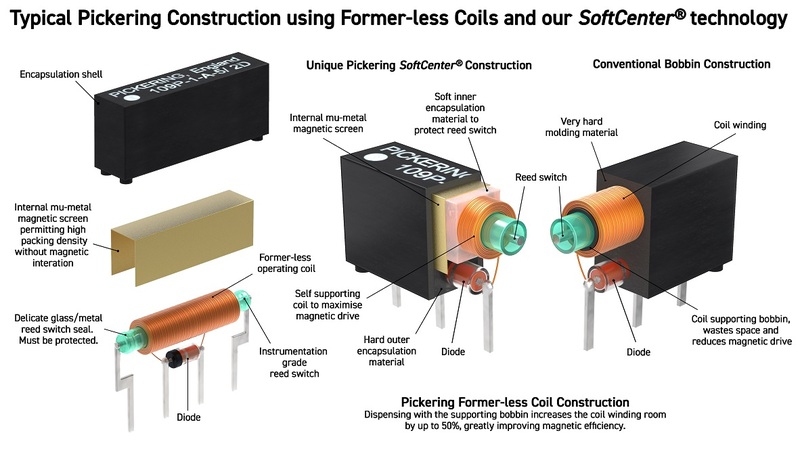 In the case of the smaller relays types, this gives around 50 percent more room for the coil winding, allowing the use of less sensitive reed switches with their inherent advantages of higher operating and restoring forces. In some ranges, this technique allows Pickering to achieve extremely high coil resistance figures. 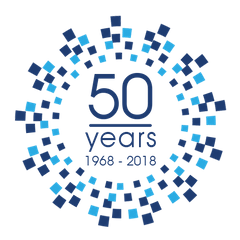 Pickering relays feature the very highest quality ‘instrumentation grade’ reed switches to meet the exacting demands and long life required of today’s equipment manufacturers. Pickering relays are 100 percent tested for all operating parameters including, operate and release voltages, operate, release and contact bounce times, contact resistance, contact resistance stability and insulation resistance.